that’s why I wanted to leave. The next morning I got up at 6am and was out the door by 7am with my running buddy. He is training for a marathon in Tennessee in July. It starts at 12am, isn’t that crazy? someone to chat with along the way. I had told him I was a little sore after teaching Body Pump class the other day. He had told me he was also tight after racing a 10k the day before. Throughout the run we continue to ask each other how the other one was doing. Towards the end of the run, he had asked me again, and I said “great”. Before getting a chance to ask him, he had taken a tumble. I asked him if he was hurt, and he said “just my ego”. Luckily no one was around. We ended the run with 14 miles. Overall it was a great run and I was happy to have finally gotten my long run in. Do you have a hard time finding balance? Holy cow, 14 miles?? That's impressive!!! Glad it was such a good run for you and your buddy, despite his fall. Yea it was. Thank you! 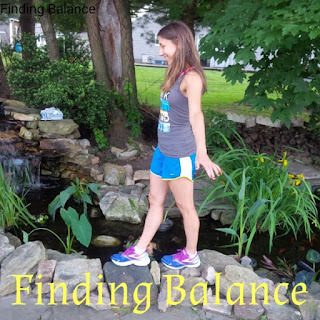 My balance challenge happens whenever the kids' schedules change, which it just has with the end of the school year. It's tough sometimes to shift gears and find a new workout schedule that works around everybody else's. I'm sure balancing your schedule with kids is a challenge in itself. I'm definitely struggling with this. I had my routine down, and then having a bay changed everything. Five months later I still don't feel like I have a routine figured out. Hopefully sooner than later we'll get into a rhythm that works well for us where I don't constantly feel like I'm struggling to fit it all in. I can't imagine fitting everything in with having an infant. But you do a great job! I'm really struggling with finding balance right now. Since my son broke his leg and we got the puppy, my free time is down to zero. It's been really hard and I'm pondering what I need to give up. Matthew gets out of school this week, and I won't have to drive him anymore so that might help. We'll see. I'm sure the puppy keeps you very active. I think everyone struggles with balance every day. SO many things to do - always. 12am marathon? WHAT? That's crazy!!! Yeah how about it? That's what I told him. Make sure you take a nap to follow me online... I still need to figure some stuff out and have to get my night training runs in. It's a sense of adventure.. Still not sure why my parents don't me want me to call them when I am finished to let them know I am ok. Yes I will definitely be following you. Heck I'll probably just be getting off work at that time. I definitely struggle with this. It is really hard to fit in running and a social life. People who don't run don't understand leaving leaving or not drinking because of training or a race. I know right? I deal w that often in my other crowd of friends. I struggle with the sleep but not really because of balance issues. For some reason my sleep patterns seem to come in waves and after our trip to London in April, I could not sleep past 4am. Keeping running quiet from non running friends can be a challenge, particularly when you are out to dinner or at a party. No fun being the party poop! Yeah I know. That is always a challenge for me. I think sometimes running makes us happier than staying up late! :) I go to bed around 8-9pm every night so I can get up to run before work. I know I am always happier when I get that done first thing. I NEVER go out on school nights because I NEED my sleep! Agreed! Running just puts me in a good mood. I've gotten better about finding balance. This past weekend we got in from DC and I had a graduation party on Saturday night to attend. We went but left early, and I only had one drink, so I could get my morning run in the next day. I told my friends I had a run; they've learned to accept it haha!